Know a young person who's got wise words and a knack for rhyme and meter? 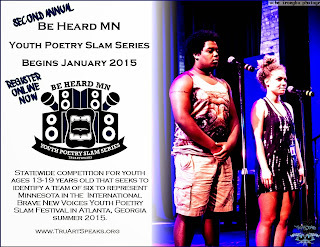 Invite them to Be Heard MN for the second annual Youth Poetry Slam Series hosted by TruArtSpeaks. See below for the slam schedule and details for registering their voice (and slot)! 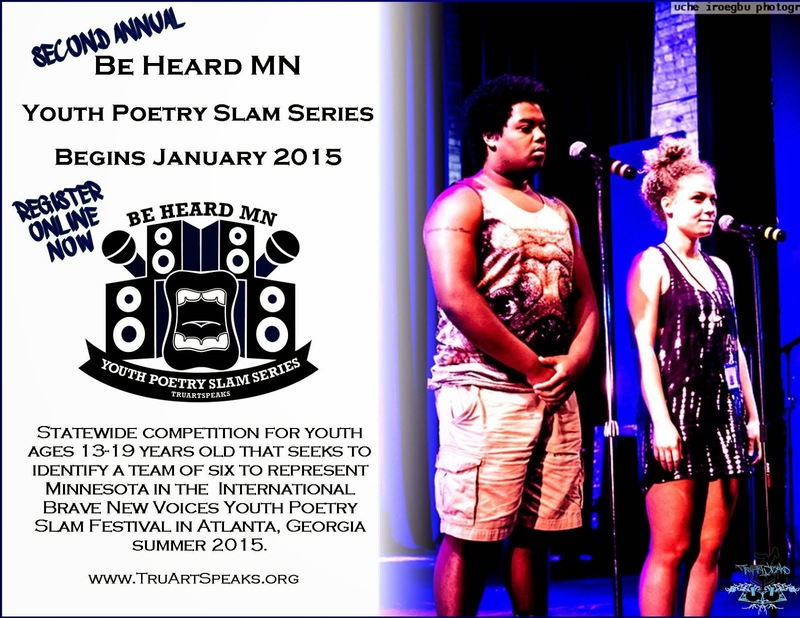 Minnesota Youth Poets: It is Time to Be Heard! Starting in January, Minnesota youth poets will once again have a chance to sharpen their craft, showcase their work, and build community with each other. The Be Heard MN Youth Poetry Slam Series, organized by TruArtSpeaks, reached hundreds of MN youth last year, and this year promises to be even bigger. 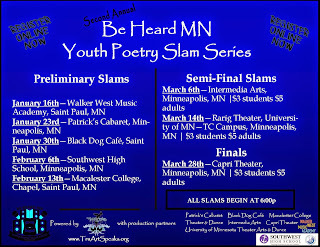 Be Heard seeks to identify a team of six youth poets residing in the state of Minnesota between the ages of 13-19 to represent the state at the annual international Brave New Voices Youth Poetry Slam Festival. In 2015, Brave New Voices will take place in Atlanta, Georgia, and six eloquent Minnesota poets will share their stories, their perspectives, and their art alongside the growing 600+ youth in the Brave New Voices network while being mentored and guided by some of the greatest arts educators and organizers in the global community. To participate in the series, poets must register online at www.TruArtSpeaks.org – space is limited, so register as early as possible. Six poets will advance from each preliminary bout into the semi-final competitions held at Rarig Theater on the University of Minnesota Twin Cities Campus and Intermedia Arts in early March 2015. 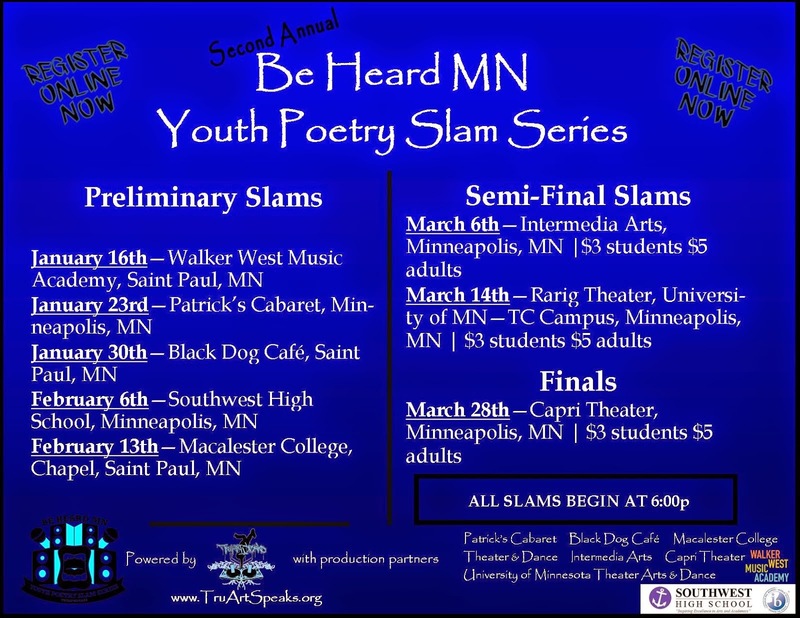 Fourteen finalists will then advance onto the Capri Theater stage on March 28th, 2015 at 6:00p to compete for their spot on the 2015 Be Heard MN Youth Poetry Slam Team.